Father’s day is coming up fast so you need to think fast. Especially since all dads are not created equal, which makes it that much harder to shop for them. But thankfully there are Father’s Day gifts out there that, no matter how unique the man is, will be sure to put a smile on his face.. also make him feel pretty handy or classy. So whether your dad is a tech man or outdoorsy, you’ll be sure to find something pretty awesome for him! We all have the coffee addict in the family or at least the person who appreciates the craft and culture. And if your dad or husband is either one of these two (or he just needs some good coffee for on the go in the morning), then this coffee tasting kit is definitely going to make him happy. This is also great if he’s a bit picky.. because we also have those kind of people in our family. Make this one of your Father’s Day gifts and check it out here . Every man shaves so this is just pretty darn practical and classy. Coming with everything he needs to have a great shave (and in fun packaging which means less gift wrapping for you), he can feel smart and prepared. I mean just look at how cool it looks! Check out this father’s day gift here . Alright now this device is pretty awesome. Especially if you (or he) are looking for a smart portable voice activated device. You want to order a pizza or know the weather? You got it. You want it to play music from Pandora, Spotify, Prime Music, iHeartRadio, and TuneIn? Totally! This guy has the ability to connect to Wi-Fi or mobile hotspots. Feelin’ in the mood to listen to your own music on your phone or tablet? That’s cool, it connects via Bluetooth. Oh! And it’s always adding new skills and features (cuz it’s a smart device after all). I’ve used this before and to be honest, it’s a bit addictive to be standing in the room doing something and then just ask it to give you some info that you need or play some good music. So whether your dad likes tech or not, he’ll definitely have fun with this as one of his Father’s Day gifts. Check out this Father’s Day gift here ! Even if your dad or husband travels for work a lot or not, this is seriously a great gift if he wants to look well put together when on a trip. Also, losing small things when traveling is easy to do, so getting a gift that’s high quality, looks great, and keeps everything together is just smart and practical.. also it just looks plain great. Take a look at this Father’s Day gift here . So if your dad is a bit of a handy/outdoorsy kind of guy, then this is probably one of the best Father’s Day gifts you can get him. And you don’t have to be out in the wilderness or on a campground to use it. If you’re just in your backyard starting a fire in the fire pit, he can have fun with it and use it there too. Coming in a waterproof container, it includes a military grade torch, a magnesium fire starter rod, striker, scraper, compass, and tinder. 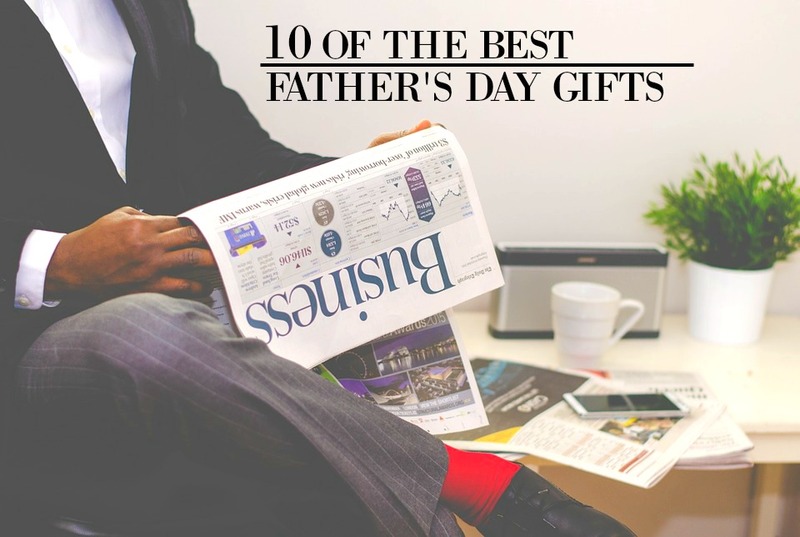 Get these Father’s Day gifts here ! I seriously love this watch. It’s practical and classic, but unique enough to where your dad or husband will stand out.. in a good way. Coming in the original grain and with a leather strap (nothing manmade here), he’ll have a bit of a rugged but sophisticated look.. you know, the manly look? Make this one of your Father’s Day gifts, and check it out here ! If he’s a bookworm and on the move a lot then a Kindle is definitely a practical and useful gift for your special guy. And even if he’s not on the go, it’s still a great way for him to have easy access to all his books in one place (also it takes up less space than 20 books piled here and there). Get this Father’s Day gift here . Now this is a great book if he loves to grill in the summer. Coming with plenty of tasty and easy recipes, the Meat-Smoking Manifesto will probably fulfill any cravings he has. Oh.. and the writer of this book? He’s been a winner of every major barbecue award.. in case you (or your dad or man), were curious. Basically, he knows what he’s doing. Now last but definitely not least in the way of Father’s Day gifts, is this American Crew shampoo. AC has been well known for their high quality products and good prices. And whether your dad or husband has oily, dry, or hard to manage hair, this product will be great for him. It’s practical, but also a classy brand. It’s something every man should have in his bathroom (alright so that might be a hyperbole… but it is pretty great). Make this one of your Father’s Day gifts and get it here . No, but seriously, I hope I was able to help you, and if you have any questions or your own ideas for Father’s Day gifts, then let me know in the comments below. I’d love to hear them!